1 Combine ground beef, bread crumbs and Hellmann's® or Best Foods® Light Mayonnaise in medium bowl; shape into 24 meatballs. 2 Bring sauce with chipotle peppers to a boil over medium-high heat in 3-quart saucepan. Gently stir in meatballs. Reduce heat to low and simmer covered, stirring occasionally, 20 minutes or until meatballs are done. Stir in cilantro. 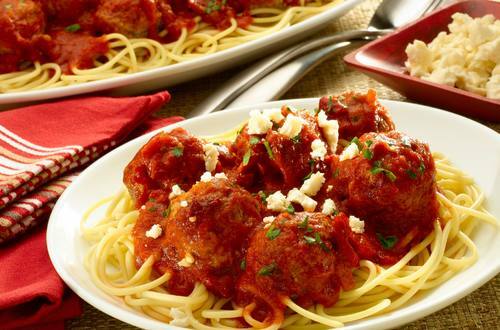 3 Serve meatballs and sauce over hot spaghetti and sprinkle, if desired, with queso fresco cheese.